Satisfaction overall, the study shows, hovers at around 40% -- far from ideal. Additionally, it received more than 3,100 impressions. In just one day, this tweet became No. 2 on my Top Tweets list for April -- ranked against those that have been out there for two to three weeks (within 48 hours, it was No. 1). Why the tweet performance statistics? Because the high level of activity of the tweet informed my decision to write a No Jitter post on the research -- a first for me. I think interest in the tweet resulted from the juxtaposition of low satisfaction with a traditional interaction channel, IVR, and high satisfaction with a digital one, online chat and video. As detailed in Dimension Data's 2017 Global Customer Experience Benchmarking Report, organizations report that they are giving their customers, on average, a choice of nine different channels with which to engage with them. That number is forecast to rise to 11 by 2018. What the data says to me is the availability of channels is just the beginning of the answer to improving customer satisfaction. Those of us in the contact center industry know that availability of multiple channels frequently masks a hodge-podge of solutions and processes that haven't been integrated. 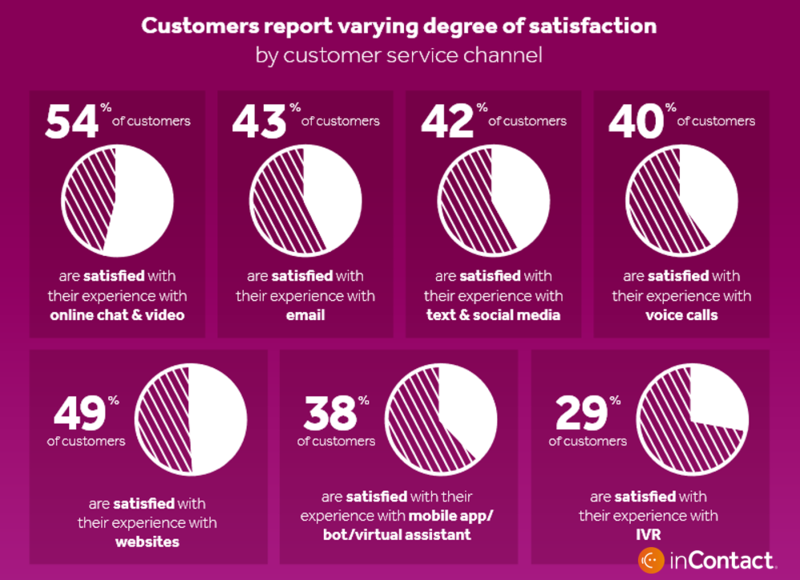 I believe that confusion is what we see highlighted in this consumer research -- no single channel is providing great customer service because the systems supporting that channel typically do not provide the agent or self-service application with all of the required context in a quickly digestible way. While some will look at the data above and say, "Yeah! Customers still want to call a live agent," others will draw less positive conclusions. Companies don't offer a rich selection of digital customer support choices. Customers are not familiar with the availability of digital alternatives. A consumer's past experience has shown that alternatives like visiting the website, using a mobile app, or starting an interaction on social media have not been successful. The data inContact reported last week is the first of a two-part study, said Cheryl Andrus, senior director, Corporate Communications. 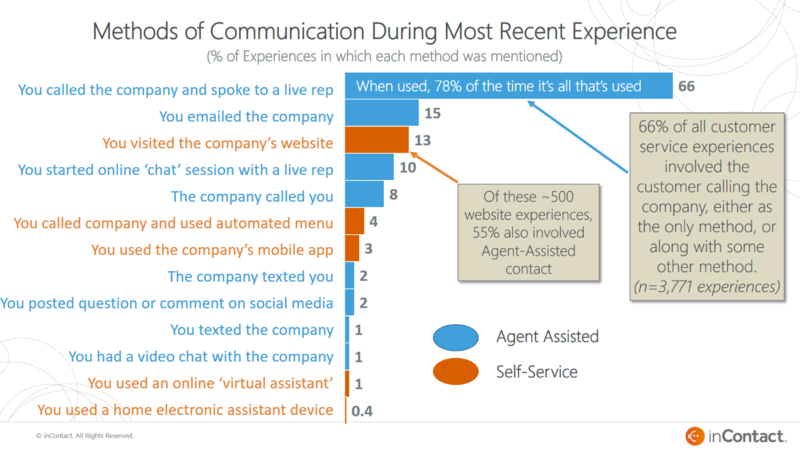 This first part compares consumer experiences across 10 agent-based and self-service channels. The second part will report on business leader perceptions about channels and the best way to address consumer preferences and expectations. inContact expects to publish the second part this summer. In addition, inContact intends to conduct this study annually, and track changes over time, Andrus said. Because inContact will be interviewing businesses and consumers, I believe it should be able to ask corollary questions that allow for direct comparison of the consumer and business opinions on the same issues. Support for inContact's research initiative started at the top. As inContact CEO Paul Jarman told me via email, "Consumers always want more from companies, and competition is fierce for consumer loyalty. We conducted this research to shine the light on how consumers are actually using the variety of service channels -- and most importantly which channels drive loyalty and advocacy."